It is telling, I think, that although Hillary Clinton continues to have a substantial lead over her Democratic rivals in national polls, media pundits are openly wondering whether her recent drop in those polls suggests, as one critic it, “It might be time to start panicking.” In the latest Huffington Post aggregate polling average, Clinton receives about 44% support, which leads her nearest rival Bernie Sanders by 18%. Meanwhile, although Donald Trump does slightly worse, comparatively speaking, in the Republican national nominating aggregate poll than Clinton does in the Democratic race – he is at about 33% in national polling averages, also 18% ahead of his closest rival Ben Carson – no one seems to be suggesting that he start panicking. Instead, the talk remains about how he continues to defy expectations. Yes, I understand the news coverage is driven as much or more by perceived polling trends as it is by absolute levels of support and polling margins. But if we do focus on trends, isn’t it also worth noting that Bernie Sanders’ national polling support has basically flattened out during the month of September? Clinton does not seem to be losing support to him of late as much as she is to the “undecided” category and to Vice President Joe Biden, who is undergoing his own “discovery” phase right now despite not formally committing to running. More generally, relative to their contenders, would one rather be in Hillary’s polling position right now, or The Donald’s? Poll results this early, of course, are not very indicative of who is likely to win the nomination, as I’ve pointed out elsewhere. And state polling is probably a more useful measure of candidate viability than are national polls in any case. Nonetheless, if the media persists in reporting on national polls, they might try harder to put these numbers in a more realistic context. Of course, this has been a problem with the media’s coverage of Trump more generally, a point that David Uberti makes in a very nice piece he wrote for today’s Columbia Journalism Review. While acknowledging that the media’s disproportionate focus on Trump is partly responsible for his staying power atop the polls, Uberti points out that Trump’s ability to drive media coverage through his recurring rhetorical firebombs and personality-driven campaign tactics makes it harder for journalists to cover him as they might a more traditional candidate. As he writes, “When the press does attempt to hold Trump accountable, he parries and pivots to highlight his strengths, however abstract.” This is not to say that Trump hasn’t received his fair share of negative media coverage. As this graph by John Sides indicates, the proportion of negative news coverage, at least through August, is greater for Trump than for the other Republican candidates. But much of that negative coverage has focused on his personal attacks on other candidates and his outlandish pronouncements which don’t seem to matter nearly as much to potential voters as they do to journalists. And it has been counterbalanced by the media’s usual focus on the horserace numbers, which right now show The Donald trumping the Republican field. It is no wonder that as Trump’s polling numbers went up we’ve seen a steady climb in his favorable ratings over the last two months as well, despite the negative news coverage. It is tempting, of course, to argue that rather than the outsized media coverage, Trump’s support is instead driven by unprecedented voter anger at the political establishment. But to quote one wise media pundit, “I have two words for that theory: absolutely ridiculous.” The fact is that anti-incumbent fervor has been running particularly strong for at least the last three election cycles, if not longer. And in terms of right track/wrong track measures, polls indicate voters were more bearish on the country’s future four years ago than they are today. Similarly, trust in government was also lower four years ago. In short, this doesn’t look like an unusually angry group of voters, at least not by recent standards. Of course, even if overall levels of voter anger aren’t any higher, much of it might be disproportionately fueling The Donald’s campaign. But, as John Sides points out, it is hard to see why this would explain changing levels of support for Trump. If, as I believe, Trump is largely a media-enabled political phenomenon, how might journalists adjust their coverage to balance their very understandable desire to cover “newsworthy topics” (read: ratings generators) with a more accurate and useful assessment of his candidacy? One way is to put polling results in a better historical context, a point I made to Uberti. A second way, as I suggested in this earlier post and again in Uberti’s article is to press Trump to go beyond broad policy pronouncements (“I will build a yyuuge wall”) to focus on specifics – how does he intend to remove 11 million undocumented immigrants? A third way, as Greg Sargent points out in his Morning Plumline post today, is for journalists to spend more time focusing on the structural impediments built into the political system that have made it so difficult for previous presidents to work with Congress in areas like government spending, immigration and entitlement reform. How does Trump propose to overcome the partisan polarization and gridlock that characterizes Congress today? Does he understand the very real limits on presidential power – limits that have stymied previous presidents who took office promising to change the Washington, D.C. political culture? In short, why should we believe he would be any more effective than previous presidents in getting things done? It’s not difficult to do this. For example, instead of asking The Donald about why he didn’t correct a questioner at a Trump rally who believes Obama is a Muslim, why not ask him what he will do differently from presidents Bush and Obama to get immigration reform legislation passed? It is easy for pundits to characterize most Republican voters as a bunch of angry, gun-toting, bible-thumping xenophobic no-nothings. The truth is, however, that for all the media coverage of Trump’s standing atop the polls, about 70% of Republicans haven’t bought into his candidacy. Frankly, this does not surprise me. When I watch Republican campaign events and listen to the questions voters ask candidates, and when I talk to them later, most are genuinely interested in the details of what those candidates have to say, whether it is solving the immigration problem or creating jobs or dealing with ISIS, than they are about the Donald’s pronouncements regarding Carly Fiorina’s looks. Yes, voters are angry, although perhaps no more so this election cycle than in previous years, and yes, some of that anger may have led them to take a longer initial look at Trump (and other nonpoliticians) than he might otherwise have received. But the simple truth is that by focusing on what Uberti aptly describes as “Trump’s blowhard improvisation”, and failing to place polls in their historical context, the media has both contributed to his polling support and made it far easier for Trump to avoid answering the difficult questions regarding the specifics of his policy beliefs, and how he proposes to implement them. This does a disservice to voters and, I think, to Trump himself. If journalists are content to generate media ratings by focusing on the more circus-like aspects of Trump’s improbable candidacy, he has very little incentive to change his game plan. And we are all the worse off because of it. Another day, another poll indicating that the devastating Bain attack ad and the “go for the jugular” targeting of Romney’s tax returns are, as yet, still not resonating nationally with likely voters. According to a USA Today/Gallup poll in the field from last Thursday through Sunday, “by more than 2-1, 63%-29%, those surveyed say Romney’s background in business, including his tenure at the private equity firm Bain Capital, would cause him to make good decisions, not bad ones, in dealing with the nation’s economic problems over the next four years.” The persistent polling results belie the oft-tweeted claim that the Obama ad campaign has “swift boated” Romney by turning his supposed strength into a weakness, much as the Bush campaign allegedly did to John Kerry’s Vietnam record in 2004. It may be, however, that the ad campaign is resonating more strongly in specific swing states, like Ohio where Obama has been outspending Romney so far. Even here, however, the evidence is far from conclusive; the Pollster.com trend line for Ohio polls has Romney trailing Obama by 2.5%, 47.2%-44.7%. 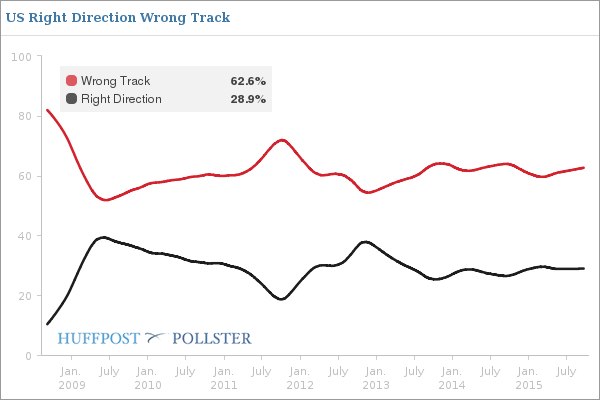 On June 5th, just before the Bain attacks, Obama led Romney there by 3.3%. But I don’t believe that counterfactual is the correct way to think about campaign effects and, like John Sides, I don’t think most reporters think this either. The reality is that most journalists are interested in the net impact of campaigns in the real world, not a hypothetical one. However, because they cover campaigns on a daily basis, they tend to think those effects are quite large. Most political scientists disagree. They believe that in the world in which we live, campaign effects, such as the Bain ad or Romney’s tax returns, are much more limited for at least three reasons. First, of course, both sides are struggling to frame the election in ways most favorable to their candidate. So voters aren’t just hearing about Bain – they are hearing about unemployment on Obama’s watch as well. There are dueling messages out there that voters hear and respond to. Second, by the time campaigns are in full swing, most voters have already made up their minds based on longstanding predispositions guided by, for instance, an affinity to one party or the other. Current polling suggests that up to 90% of voters are already committed to either Romney or Obama. Many of the remaining undecideds are, at this point, not paying much attention to the campaign at all. Given this, it’s no wonder Bain hasn’t moved the polls. Third – and I can’t emphasize this enough – reality in the form of those “fundamentals” is the grist for candidates’ campaign mills. Why is Obama targeting Romney’s record at Bain rather than, say, his foreign policy comments? Why is Romney touting his business credentials? It’s because the fundamental issue driving this race is the economy. You can’t simply substitute a “virtual reality” through the skilled use of clever campaign visuals when voters have independent sources of information by which to assess what the ads are saying. Avery is right, of course, in that individuals’ typical cognitive processes often cause them to engage in selective exposure to campaign ads in a way designed to reinforce existing attitudes. (As evidence, see almost any partisan blog!) That doesn’t sound like the world I describe consisting of rational voters who objectively sift through the campaign ads to choose the “best” candidate. But I am making a less heroic assumption regarding voters’ rationality. By collective rationality, all I ask is that most voters can distinguish one candidate from the other ideologically, and choose the one closest to their own political views. And most studies suggest voters are very good at doing this, particularly in an information-rich environment that is a presidential campaign. So, Joe Sixpack may not understand the intricacies of off-shore tax shelters, and he may stubbornly insist that Obama is not a U.S. citizen, despite overwhelming evidence to the contrary. But generally speaking, he knows that Obama is a stronger supporter of an activist government, greater business regulation and higher taxes on the wealthy than is Romney. He knows this from talking with others on Facebook (ok, that would be Joe Brandy Snifter), hanging out at the ball field and maybe even glancing at the evening news – that’s where the “collective” process comes in. And in deciding how to cast his vote, after absorbing this information, Joe Sixpack chooses – in the context of an economic downturn – which set of views is closest to his. I think most voters do this quite well. The reason why the best forecast models are so accurate is that they essentially distill this process down into a few key variables that measure “reality” – the state of the economy, perhaps presidential approval, whether the nation is at war – and assume the rest of it – the campaign ads, etc. – play off this reality. Now, as Stuart correctly notes (and as I have said many times before), when reality does not clearly differentiate one candidate from the other, any of these other factors – debates, the V.P. choice, – even the Bain ad! – can conceivably make a difference. Journalists, who must file a story every day, have to focus on something, and so they emphasize this aspect of the horse race, as viewed through the daily prism of campaign stops, messaging, gaffes, etc. But if you insist on accepting the horse race metaphor, then at least realize this: the candidates aren’t always riding equally talented horses. Sometimes one candidate starts on Secretariat, while the other is riding a three-legged jackass. Even then, however, it is possible something dramatic might happen. That’s why we run the race! Meanwhile, keep those comments coming!